The Digg API Visualization Contest held to celebrate the launch of the Digg API is now in its final stages with 10 shortlisted candidates. Four of the ten finalists are Abode Apollo based applications, remarkable for a platform launched just over 2 months ago. D’Lite is an Apollo application that utilizes Digg’s API to retrieve data, information, and processes. Features include pagination, favorites, network detection, and smart auto refresh. Digg Watch is a tool that lets users browse Digg and grab information from stories, like who Dugg what stories and how many Diggs a story gets over time. A nifty tool in looking up user activity. Mini Digg allows users to view stories and see the story activity. A story tracking feature allows users to save favorite stories for future tracking. 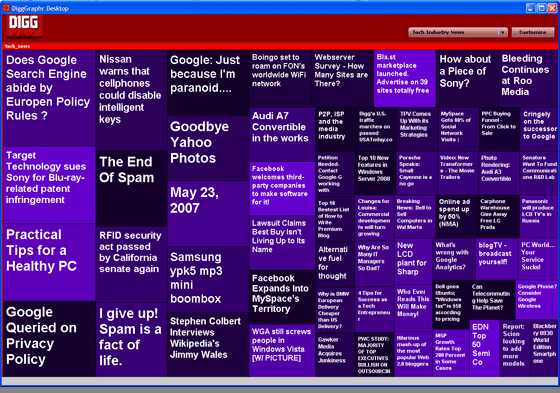 DiggGraphr is a desktop application that lets users browse Digg stories in treemaps. The application allows customization as well as choice of Digg Channel. All four have individual appeal and are generally clever implementations of data pulled from Digg and generated under Apollo. Voting closes May 30.